4.5 (Based on 25 Reviews) 100% of reviewers recommended this product. I've only had a chance to use this eyepiece one night since I've gotten it but it works fine in my 80mm f5 telescope giving a 1 degree f.o.v. at 67x. I barlowed it for 133x to look at the moon and was surprised at the detail in this little scope. This is one of my favorite lenses I own. The wide angle makes this a great purchase. fine eyepiece, took it to Death Valley over Christmas. I'm not sure if it was because it was so clear tonight, or very low atmospheric turbulence, or that the moon was high, but I was wowed by the clarity and sharpness of my first views through this eyepiece. A huge improvement over the cheap 6.3mm that came with the scope (102mm refractor). A great value for $42. Never expected such good results from a mere $45 eyepiece, but wow was I blown away! So comfortable to look through! Great for extended viewing; didn’t strain my eye at all, and the wide field is very nice for locating targets. In my modest Celestron Astromaster 90mm F/11 refractor this eyepiece gave me my best, most comfortable views of Saturn yet, and with excellent contrast! Adding the 9mm version to my toolkit after only one evening of viewing through this solid performer was a no-brainer! This 6mm just replaced all my Plossls! BAM! This is not my first 6mm EP, but it is my best. Much easier to use, with comfortable eye relief. I have had the ESW 9mm for 3 years and it is one of my (and others) favorite. I bought the 6mm for a friend who got a 130mm Orion reflector. This performs very nice in his scope (150x). Tried it in my Cat at f6.3 and Saturn was sharp. Awesome views of the moon. Review by WILLYR9 of Mesa, AZ. Great for my 100mm binoculars. I tried others but these work great for my 1.25" 10mm binocs. Review by RJ of Daytona Beach, Florida. This ocular was purchased for use with my 120mm f/5 refractor. As this is a wide field telescope I wanted an inexpensive wide field eyepiece to go along with it. I did not expect excellence from an eyepiece in this price range, but I am satisfied with my purchase and the views that the eyepiece delivers, which I would rate as good. I would recomend this eyepiece for beginer to intermidiate amateur astronomers. Review by craytab of PA. I got this EP to mostly use in my f/10 refractor. It works great in that long focal length scope, pretty sharp to the edge. I have tried it in my f/5 and f/4.7 scopes and it gets a little messy at the edges. Further, it is not as sharp as some other EPs, but those are much much more high end. Overall, this EP offers a good widefield for scopes with a longer focal length. This could represent an excellent value for those on a budget, beginners who don't want to break the bank, and for outreach events. Review by Ravi Bhat of Bangalore, India. 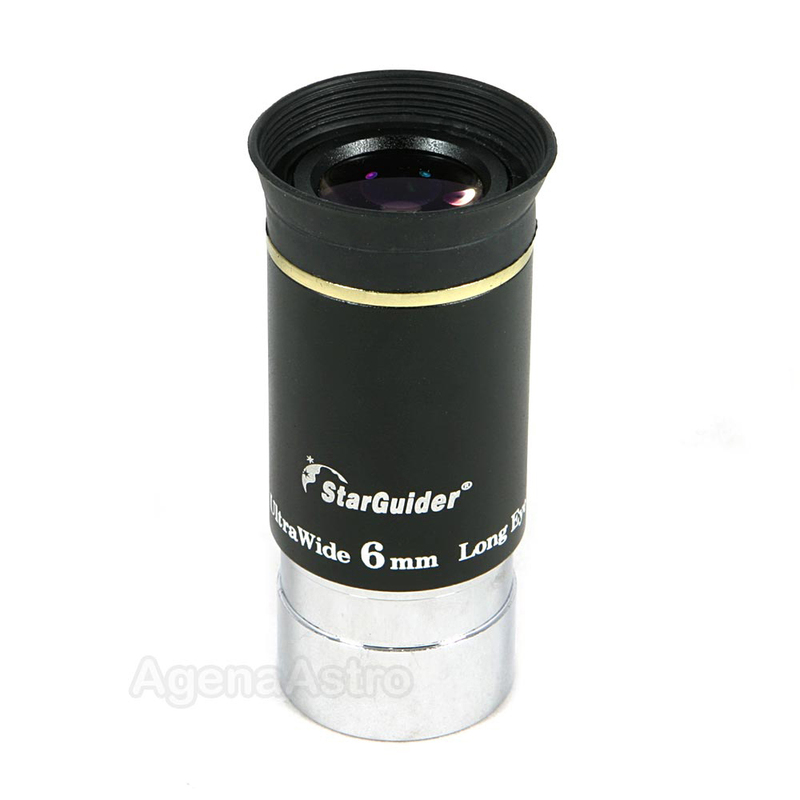 A very good eyepiece for a great price! This is one of my favourite eyepiece on my 10" f/4.7 dob giving 200x magnification. The central 85% of the field is very sharp. From my moderately light polluted skies, I find it quite useful for planetary viewing as well as for viewing DSO's. It is advertised as having 66 degree of apparent field of view. To my great surprise, when I measured the actual field of view by star drift method, it turned out to have 24' of field at 200x, implying 80 deg apparent field of view! The only disadvantage I can find with this eyepiece is that it is quite sensitive to eye position and prone to black-out. But I'm not complaining, it's value for money. Review by rookie of Lake Elsinore, CA. I am new to the hobby and these EPs were recomended to me as a great buy. Well they were right. It provides a great wide view for a high power EP. Used in a 102x800mm refractor with a 2x barlow. I viewed Jupiters bands and was able to make out the BRS on a recent trip to the desert. Review by c0r0nel of Mendoza, Argentina. It's a great eyepiece for the price, good FOV and very comfortable eye releif. The only cons is the quality of the materials is not the best, but is enough for the low price. Review by Thom of Tampa, FL. I use this with several mid f ratio refractors. Review by Zman of New Jersey. This eyepiece is as good if not better then the one I have from one of the "BIG" companyies, and it was half the price and shipping was FREE. The image is flat ALL across the field. I used this last night with my 120mm Refractor on Jupiter and I was IMPRESSED (I have been observing the night sky for over 50 years). I am glad I found this web site. Review by Alex of Chih. Mex.. I purchased this 6mm ep for high power planetary. In my f/6 reflector I get 200x and 400x barlowed and the views of Saturn and Jupiter are great! at least in most of the field. At the edges it gets a bit blurry but there is no problem as I didn't pay [$] for it...Bottom line, if you want good quality eyepieces but are on a tight budget you can't go wrong with this ep. Review by Alex of Chihuahua, Mexico. 5.0 Can't get any better for the price! I use this 6mm eyepiece with my 8" f/6 reflector at 200x and 400x with a 2x Barlow, and despite having regular to poor seeing conditions I've been able to see Saturn in quite good detail, with its Cassini gap and even the shadow of its rings casted on the planet disc, I'm sure with better seeing conditions this eyepiece would perform greater! Besides, it seems very well built and I love the eye relief. A little downside (which I don't consider to be too important) is that at the very edge of the field the image gets a bit distorted, but who observes an object on the edge of the field? At the centre, where the action is, the image is sharp and nice. Bottom line, if you are a wealthy person and you can afford a TV Nagler or something like that, go for it, if on the contrary, you are on a budget like myself, you can't go wrong with this eyepiece. Great service at Agena, thanks! Review by Randy of Burnaby, BC Canada. I use this eyepiece in the Synta 190mm Mak-Newt scope. On axis I believe it matches up as well as any under $100 eyepiece. Since my mount tracks objects I really haven't closely examined for distortion or colour towards the edge of the FoV. However nothing particularly bad has caught my eye when an object has been on the edge of the FoV and I've looked to center it. I think the eyepiece is well worth it's money and I wouldn't hesitate recommending this eyepiece to anyone looking for an eyepiece that has a nicer wider FoV than a plossl and has a clear/clean image (no colour tint or softness in image). Quality lens at an affordable price. Agena provides excellent service and a wide range of affordable products. Quality lens at an affordable price. For a 6mm, this lens has a generous ocular size, but it does suffer from blacking out - difficult to keep your eye in the "sweet spot". With my 2.5X Barlow, however, it is no tougher to use than an equivalent lens, so I use it to push the limit on my scope, but not otherwise. 4.0 Not bad at all. I picked one of these up after having tried the 9mm version of this lens series. I was happy to find that its an equally well made lens. As with the 9mm this lens performs. The FOV and eye relief are pretty good. In my scope it does suffer from blackouts at times, especially when Barlowed, but nothing too bad. The images I saw with it just tonight were well worth the meager price of admission. With my 8" dob at 200x my views of Jupiter were truly outstanding. The barrel threads are nicely machined and accepted any filter I tried. Always a good feeling. With the Barlow this lens becomes my secret weapon at 400x. I can't wait for a night clear and still enough to make use of it. I picked one of these up after having tried the 9mm version of this lens series. I was happy to find that its an equally a good product, truly a keeper. As with the 9mm this lens performs. The fov and eye relief are pretty good. In my scope it does suffer from blackouts at times, especially when Barlowed. The images I saw with it just tonight were well worth the meager price of admission. With my 8" dob at 200x my views of Jupiter were truly outstanding. The barrel threads are nicely machined and accepted any filter I tried. Always a good feeling. With the Barlow this lens becomes my secret weapon at 400x. I can't wait for a night clear and still enough to make use of it. The lens itself is well made, good quality crafting. And the price tag truly hammers it home. I wouldn't mind owning the entire series. Its a good one. I got this lens based on my great experience with the 9mm version in this set. I use it with my 8" f/5.9 dob. Works great. I'm pulling 200x with it, a good mag to have on clear nights. Its my secret weapon with the Barlow at 400x, my highest powered lens for those rare, ultra clear nights. The lens itself is very well made. I love the wide fov and pleasent eye relief. A solid performer producing sharp and clear images that will leave you smiling. Not to mention the affordable price. I wouldn't mind having the rest of this set, they are really nice EPs. Agena rules! Give one a try! Eye Lens Diameter 20.7mm / 0.82"